Our most popular golf course bridge, the Woody is slightly arched and has a finish which makes it look like ‘real wood’. Its style of beam has been designed by our engineers as the optimal for structural qualities. The standard model comes with curb-style guard rails. The Woody Bridge is Links Bridges most popular golf course bridge. Golf courses across North America have installed this innovative, slightly arched, wood finished bridge. Links Bridges prides itself on being an innovator in the special application bridge business and is celebrated around the world for the development of awe-inspiring golf course bridges. Here are our top five reasons to choose the Woody Bridge from our collection of bridge styles and designs for your commercial or residential project. Every pedestrian bridge from Links Bridges will retain its structural integrity and appearance for 50+ years, far superior to any alternative using wood or metal components. For golf course bridges, this longevity is essential. Our Woody Bridge takes care of itself. There is no need to ever paint, remove rust or replace rotting boards. Just imagine all of the time and energy you can direct to managing your golf course when you don’t have to maintain your golf course bridge. The Woody Bridge is designed with all eco-friendly materials, to ensure sustainability of the environment and the product. From our scratch resistant gel-coat to fire retardant resin and beyond, all of our materials are safe and sustainable. 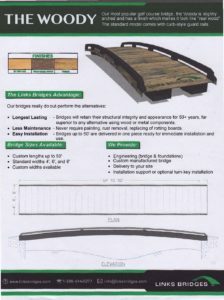 This custom-manufactured bridge comes in custom lengths up to 50’ and standard widths of 4’, 6’ and 8’ or a customizable width of your choosing. Choose the standard option with curb-style guard rails or customize your bridge to suit your needs. The Woody is designed to have the look and feel of real wood. Choose from the beautiful golden oak, cherry wood or walnut finish to inspire your golf course guests with this naturally stunning bridge. 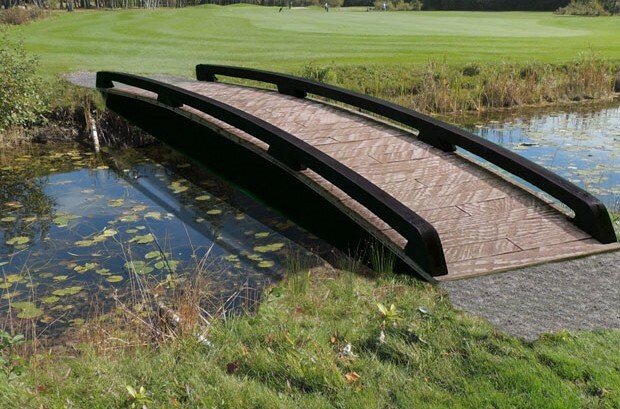 If your golf course, community, park or home residence is in the market for a customizable, 100% RFP low-maintenance, tailor-made Woody Bridge, contact our team at Links Bridges today to learn more. We have installed thousands of bridges across North America and are eager to help you install bridge of your dreams.